As he did last year, Jimmy Kimmel is taking his late-night talk show on the road to Austin for a week of broadcasts from the South by Southwest Festival. 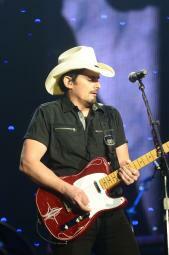 And Brad Paisley is going along for the ride. The "Perfect Storm" singer, who released his latest album Moonshine in the Trunk last summer, will be one of the comedian's guests in the Texas capital. Kevin Hart, Julia Louis-Dreyfus, Dallas Cowboys quarterback Tony Romo and Matthew McConaughey are also tapped to appear, along with blues guitarist Gary Clark Jr., who will sit in with Kimmel's house band Cleto and the Cletones. Kimmel stormed SXSW last year with an arsenal of gags and skits. The most skewering was a music-based edition of his ongoing "Lie Witness News," in which the onetime Man Show host asks passersby to comment on false stories. In this case, he sought their opinions on fake bands, including one brilliantly titled Neil Patrick Harassment. Should Kimmel need a comic foil, Paisley will fit right in. The singer-songwriter is well-known for his wry lyrics and onstage pranks. On May 15th, he'll launch his Crushin' It World Tour in Camden, New Jersey, with special guests Justin Moore and Mickey Guyton. Guyton, a Texas native and one of Rolling Stone Country's Artists You Need to Know, wowed audiences at last year's SXSW while opening up for Willie Nelson and Keith Urban.